Dr Esposito and her team at the University of Roehampton are working to fight a rare form of Leukaemia called Mixed Lineage Leukaemia (MLL), that currently has very few treatment options and has a very poor outcome for younger patients. Here she tells us about her work and why Leuka funding is so vital to beating this terrible disease. ‘My research focuses on an aggressive form of leukaemia (MML) that mostly affects younger patients. The current treatment available is chemotherapy followed by bone marrow transplantation; however, it isn’t very effective, and even those who respond initially eventually relapse, which means that the disease will come back. We believe that this happens because some leukaemic stem cells hide, or escape or simply survive the treatment. So, we need to understand how this happens to be able to kill the leukaemic cells. I did my PhD in gene and stem cell therapy. This developed my interest in the mechanisms that transform a healthy stem cell into a cancer stem cell and I decided to re-train in this field. I joined the lab of Professor Eric So at King’s College London, where I had the opportunity to work on leukaemic stem cells in particular. And my research led me to identify a new therapeutic approach for patients affected by other leukaemias. Unfortunately, the treatment would not work on Mixed Lineage Leukaemia, and that is what made me believe that we must study this disease in greater detail because this cancer is so unique. It is Leuka’s support that has enabled me to start my own independent research programme – at what is the most crucial and challenging stage in the career of any scientist. Without their funding I simply would never been able to get my research plan going. There is no other programme quite like Leuka’s John Goldman Fellowship scheme, that so brilliantly backs new ideas in the way that it does. On top of this, my own University has match-funded the Leuka grant, meaning I also have a post-doctoral researcher and a PhD student who share my ambition of finding a new treatment for this dreadful, aggressive form of leukaemia. You can help us fund even more research by donating today. MLL is diagnosed in 80% of all cases of newborn and infants (younger than 1 year old) with acute lymphoblastic leukaemia. Less than 40% of all infants with MLL survive five years after diagnosis. MLL is highly resistant to chemotherapy. Leukaemia is a cancer of the blood and it is the most common form of cancer afflicting children and teenagers in the UK. 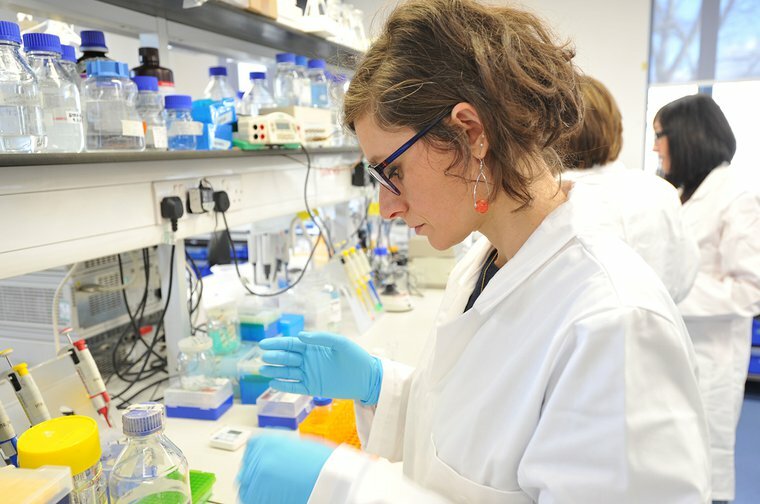 Leuka works to fund the research of amazing Doctors and scientists like Dr. Maria Teresa Esposito and her team at the University of Roehampton, who are dedicating their efforts to finding a cure. Find out more about The John Goldman Fellowship programme that support Dr Esposito's work, here.